CLICK TABS at TOP of screen for "THE LOFT" AND "MAIN COTTAGE" PAGES to SEE PICTURES & MORE ! This is truly an outdoor paradise, a special retreat less than 2 hours from Los Angeles and Orange Counties. Lake Arrowhead is situated in the San Bernardino Mtns (elev. 5100 feet) of Southern California where you can experience the clear mountain air, pristine lake, majestic pines and charming country life style. 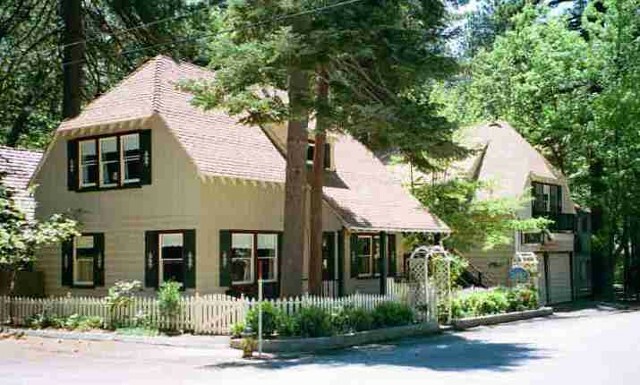 Sunset Cottages have easy street access and parking, located just 1 mile from Lake Arrowhead Village and 2 blocks from the lakeshore. Our vacation rentals are uniquely and comfortably furnished, both are set in old-fashioned knotty-pine charm, with fireplace and nicely equipped kitchen. Picturesque Lake Arrowhead offers shoreline strolling, fishing and water skiing activity. During winter, Snow Valley Ski Resort is just a 30-minute drive away.